Fording Road is located in the floodplain of the Neshannock Creek. The road itself was constructed as a fill through a wetland. Consequently, the roadway was subject to flooding seasonally and during heavy rains. 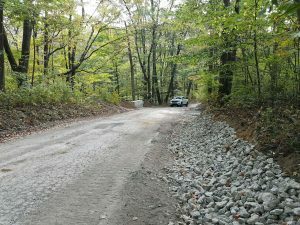 Prior to the project all of the upstream drainage was forced to flow along side the edge of the road. This condition would back water along the road berm and eventually flood the road. The project excavated a large modified French mattress (40ft. long by 24 wide) and installed four 18 inch flood overflow pipes. Site conditions were challenging because the District wanted to maintain balance of the wetland’s hydrology between the two sides of the road and safely convey the runoff from the larger storm events. Placement depth of the aggregate and the elevation of the pipes were critical to prevent draining the upstream side of the wetland, or over excavation of the downstream side of the system. To date, the project is functioning properly and over time the District and Township will get the opportunity to see how successfully the practice alleviates the flooding problem on the road. 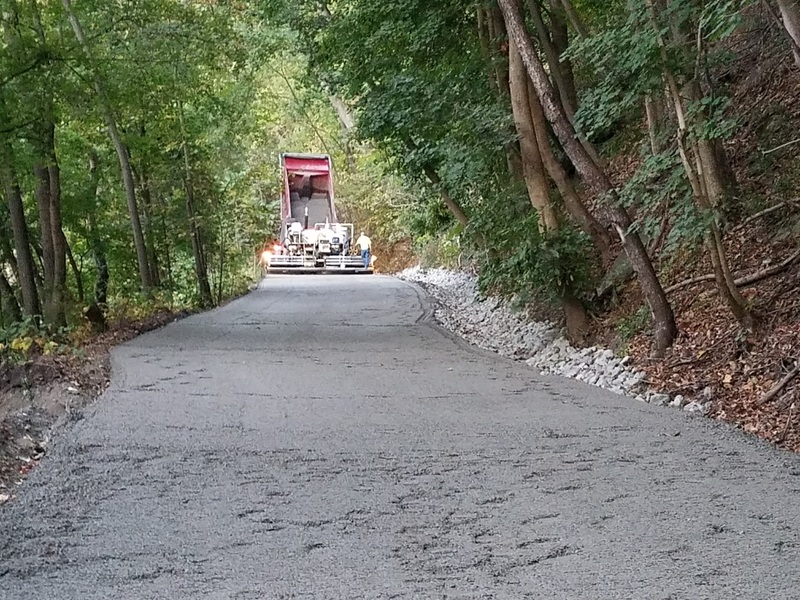 The District continued to work with the City of New Castle to complete the improvements on Neshannock Avenue. The roadway runs next to the Neshannock Creek in downtown New Castle. Drainage from the up hill neighborhoods all passess through the road before discharging directly into the Neshannock Creek. Prior to the District’s work with the City, the road bed and ditches sat fully saturated with storm water. 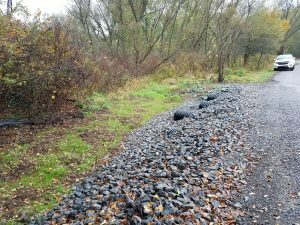 Late in 2016, the District worked with Graziani Construction to install a series of new culverts and French mattresses to alleviate the storm water problems. In 2017, the District in cooper ation with the City and Wolf Creek Holding completed the final portion of the improvements. Existing road side ditches were lined, the road base properly graded and a specialized blend of aggregate called “DSA” was used to surface the roadway. A combination of stone sizes helps the aggregate bond together to provide the City with a lower maintenance, more stable driving surface. Jacobson Road is a steep road that parallels a tributary to the Mahoning River. The road is cut into the hillside and functions as the primary conveyance of stormwater down the hill due to the incised nature of the roadway in comparison with the surrounding landscape. The few culvert pipes on the road were in disrepair and the road was in need of additional outlets. 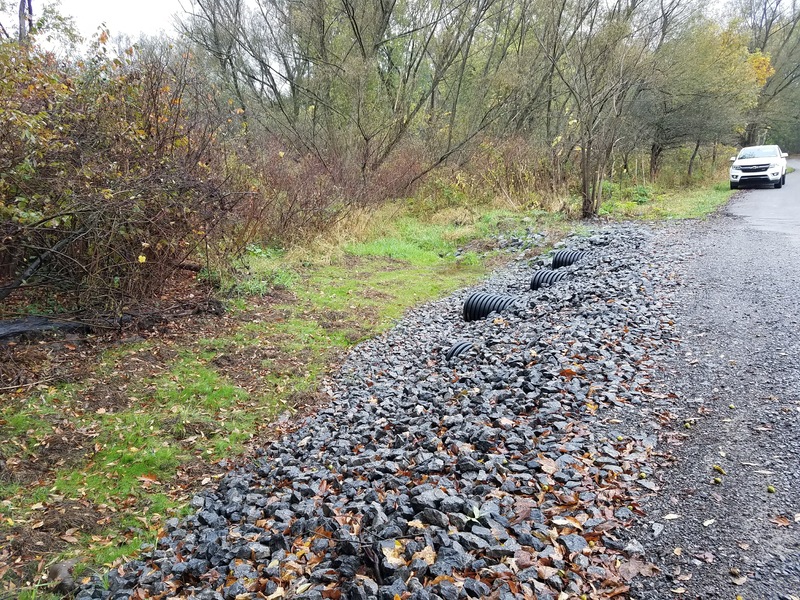 Mahoning Township applied for funding to complete the improvements, requesting to complete the improvements in two phases. The first portion of the project added stabilized turnout, an additional cross pipe in addition to replacing two existing pipes. Ditches were stabilized and headwalls and endwalls added to all of the pipes.